Harry Kane is on fire! The Tottenham's striker is currently in pole position for the World Cup Golden Boot and bookmakers are making him the favourite #1 to score a goal in England vs Belgium! 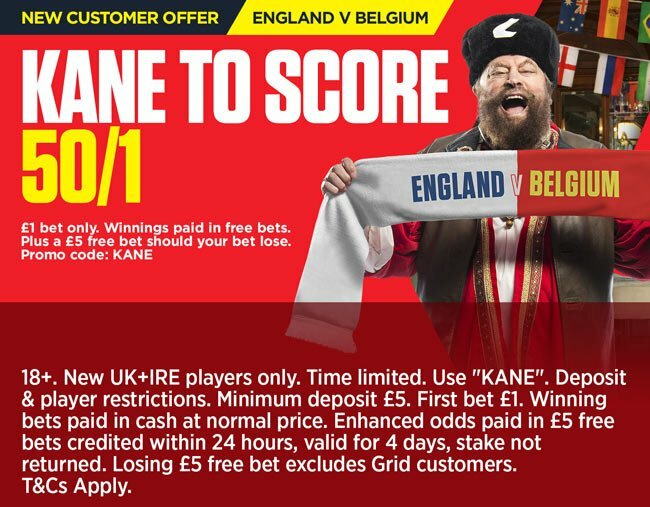 Find here how to get a crazy 50/1 Harry Kane to score vs Belgium at Ladbrokes, plus £5 free bet if you lose! Harry Kane could become the first player to score more than five goals in the group stages of the tournament since Oleg Salenko did so for Russia back at the 1994 World Cup in USA. Don't miss your chance to grab a 50/1 price boost on Harry Kane to score! Claim it in less than two minutes, it's very simple. Join Ladbrokes via our special links and claim 50/1 for Harry Kane to score in England vs Belgium! 3) Place a single bet of up to €/£1 on Harry Kane to score in England vs Belgium before the kick-off. 4) If Kane scores, your account will be credited with extra winning to make payout equivalent to enhanced odds within 24 hours. 5) If Tottenham striker fails to find the back of the net, Ladbrokes will credit your account with a £5 free bet! Harry Kane has already scored 5 goals in 2 World Cup matches, 2 against Tunisia and 3 against Panama. He has now scored in five consecutive appearances for England. Vincent Kompany and Thomas Vermaelen, two of Belgium's best defenders, are likely to miss out once again. Harry Kane is 3/2 to find the back of the net against the Red Devils, 50/1 if you claim this unmissable offer! New customers only from UK and Republic of Ireland, aged 18+. "Get 50/1 Harry Kane to score vs Belgium at Ladbrokes"